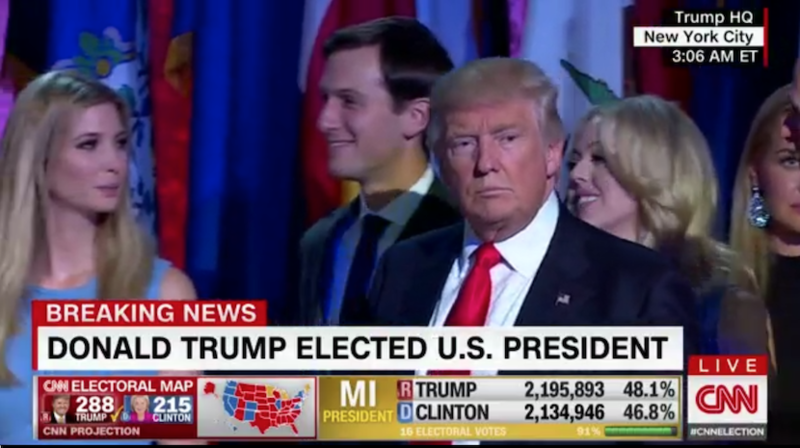 (Bloomberg) — Donald Trump is poised to pull off a huge electoral upset and become the 45th president of the United States, a repudiation of the political establishment that’s jolting financial markets even as it promises to reshape the nation’s priorities and America’s relationship with the world. The real-estate developer and reality-TV star, a Republican who has never held public office, gained a decisive advantage in the Electoral College after winning states including Florida, Ohio, North Carolina and Pennsylvania, according to the Associated Press. He is winning 264-215 as of early Wednesday, according to the AP, with 270 required for victory. In any normal year, any normal candidate would have seen his campaign ended after the controversies Trump encountered. He performed poorly in his debates with Clinton. In October, a 2005 tape from the show “Access Hollywood” was released in which he made lewd comments about groping women. After Trump denied ever engaging in the actions he described on the tape, multiple women accused the candidate of making unwanted sexual advances toward them in the past. Should Trump seal his victory, much of President Barack Obama’s legacy is at risk of being scrapped. Trump has promised to repeal the Affordable Care Act and renege on Obama’s 12-nation trade deal with Pacific Rim countries, the Paris accord to reduce global warming and a deal with Iran to constrain the country’s nuclear ambitions. The Republican has also vowed to stop the entry of refugees and other migrants from the Muslim world and to build a wall on the Mexican border to stop undocumented immigration. His agenda stands to get a boost from the outcome of congressional races, which so far point toward Republicans retaining control of both chambers of the legislature. At Trump Tower in Manhattan, a celebration had begun. “Euphoria,” campaign manager Kellyanne Conway said in a text message, describing the scene in Trump’s residence. The Clinton campaign was largely silent. Encountered in the lobby of a hotel in Manhattan where Hillary Clinton and her top staff were watching election returns, her campaign chairman John Podesta declined to say whether she would appear at a convention center where she had planned a victory party. Initially dismissed as little more than an entertainer promoting his brand, Trump overcame a deficit in polls and public approval, deep ambivalence within the Republican Party and a campaign marred by controversies and stumbles that would have knocked a more conventional candidate from the race in any other year. Trump entered the night having to win the four key battlegrounds of Florida, North Carolina, Ohio and Iowa, which he did. He then chipped away at Clinton’s so-called “firewall” in the upper Midwest. He is competitive in New Hampshire, another state Clinton expected to win. Trump’s odds of winning the White House rose as polls closed across the country, defying surveys that suggested Clinton would easily secure the 270 Electoral College votes needed to win. After Clinton won Colorado and Virginia, her team continued to express confidence that her path was solid. It wasn’t just the raw vote tally that buoyed Republican hopes. Trump outperformed Republican Mitt Romney’s tallies in 2012, particularly in rural counties. It was a sign that his turnout across the nation was even stronger than expected — and a bad omen for Clinton, who was counting on a superior ground game and anti-Trump animosity to get her voters to the polls. His actions — and his apparent ability to survive them largely unscathed — left Democrats feeling revulsion and fury over a man they considered unfit to hold the office. Trump, 70, promised to “drain the swamp” of Washington corruption, yet he has faced withering criticism for his treatment of women and denunciations of immigrants. At times he fought with fellow Republicans as much as Democrats. This year’s race has been the most volatile in decades, defined not just by gaffes on the trail or during debates, but by the specter of state-sponsored hacking and a federal probe — opened, then closed, then opened again and closed yet again — into Clinton’s use of a private e-mail server while secretary of state. After reviewing a new batch of e-mails found in an unrelated investigation, the FBI director last weekend said the bureau stood by a July decision not to recommend charges against Clinton.